This image was created at The Greek Orthodox Church of the Holy Resurrection on the north shore of Nassau County, Long Island. Truly one of the most magnificent houses of worship anywhere in New York. I remember this wedding as if it were yesterday. My wonderful bride and groom, Martha and Ari were one of the most fun couples I’ve ever had the pleasure of working with. To this day a beautifully bound leather album is on display in my gallery as a sample of my wedding photography. 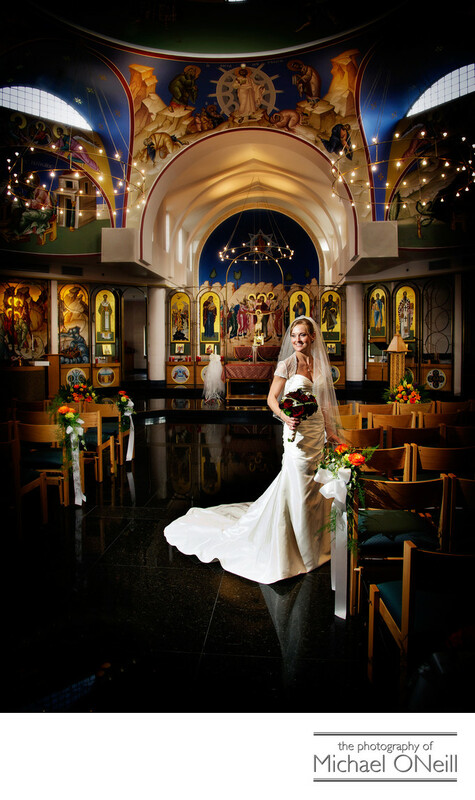 It starts with preparations at both the bride’s home and the groom’s home prior to the Greek Orthodox ceremony at this incredible cathedral. This picture was taken at the conclusion of their wedding ceremony. After this the bride and groom and their wedding party traveled up to Morgan Park in Glen Cove for some amazing sunset waterfront wedding pictures overlooking the harbor. Some of those images can be found elsewhere on this web site and I invite you to check them out.